If you’ve been around a child of any age, at any point, then you will undoubtedly know the work of Julia Donaldson. Creations like The Gruffalo, Stick Man and Tiddler have captivated children and adults alike for years. And now you can experience the magic while you’re out and about too! Forests and woods across the UK now play host to trails inspired by the Julia Donaldson books thanks to the Forestry Commission in England, which has created interactive trails filled with activities and sculptures for children to explore and enjoy. If you have children of different ages, then we know that it can be a struggle to try and find outdoor activities that are fun for all of them but this kind of thing is ideal. You don’t need to worry about the wet weather, just get your wellies on and have some fun! If (like my two) your children want to go off and hunt for creatures with terrible tusks and terrible claws and terrible teeth in their terrible jaws, then you should head to one of the fifteen forests across the UK with Gruffalo trails. There are trails as far north as Durham and Yorkshire and stretching down south as far as Exeter, with loads more in between (including our favourite in Wendover Woods in Buckinghamshire). 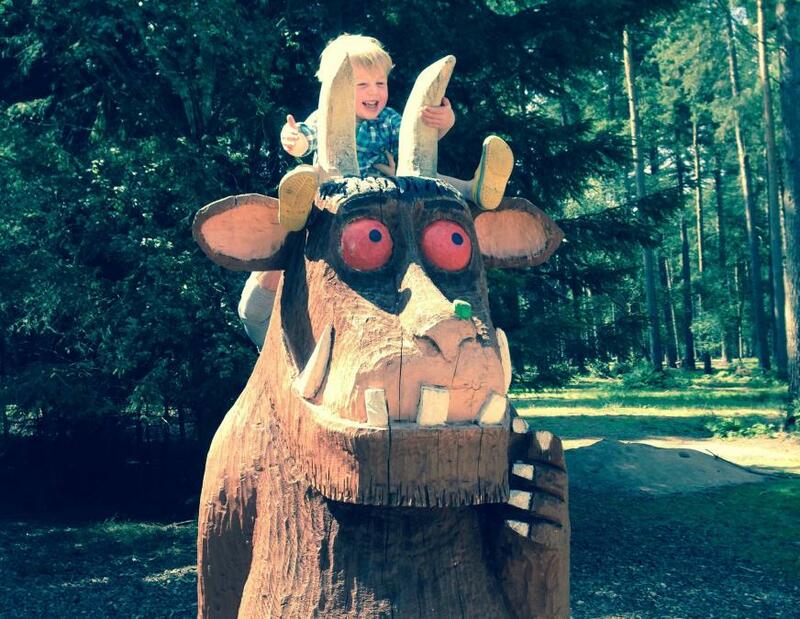 In some forests, a Gruffalo’s Child sculpture has also been added to increase the fun and there are expected to be more being added throughout the year! If you prefer to join The Highway Rat on his forest adventure, spotting characters from the story as you go, then there are now over twenty trails for you to explore. Children can collect a Highway Rat activity pack (for around £3) before they set out on their adventure. It comes with lots of fun items including a Highway Rat mask! Parents can also download activity sheets, certificates and colouring sheets to keep the magic going at home. If you prefer something a little drier, but noisier (you have been warned!) then there are some great theatre adaptations of the Julia Donaldson books too. What the Ladybird Heard is on this half term in London and Scamp Theatre is touring their version of The Scarecrow’s Wedding from 21 July to 2 September – wit, wonder and wedding bells guaranteed. Sounds like an unforgettable experience! A trip to the theatre is great fun during the holidays, wherever you are in the UK so dig out the Julia Donaldson books and get inspired today.